Just a short post to elaborate on the previous one and to clarify it. First of all, Melissa asked to see the pattern sheet... Well, hmm, of course you can but that really was a slightly masochistic question. And as for instructions... Any woman can sew, right? It was part of your upbringing. This was all you got in the way of instructions: some general information (seam allowance not included, some pattern pieces may be on the pattern sheet in two parts on the pattern sheets so you have to fit them together. 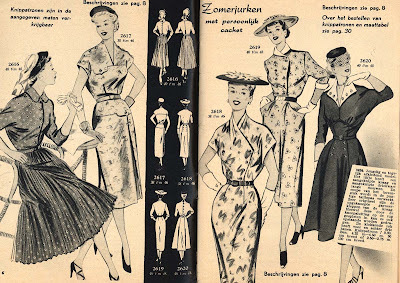 that sort of thing) and drawings of the clothes with their size, which line to follow for the pattern, the amount of fabric needed (which sounds more useful than it really is because the standard width apperently used to be 90 cm) and a describtion of the pattern pieces. 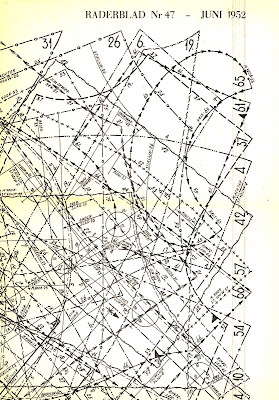 There aren't even any fabric lay-out drawings until the mid 1960's issues. A pattern with a truly unusual feature might come with some cryptic remark about how to accomplish that, but generally, you were on your own. In fact, I'm happy to have the drawings of pattern pieces because that will allow me to try and borrow some little style tricks without tracing an entire pattern. Which may well be what I'll end up doing most. Also, several of you commented on the nice clothes in the pictures I posted. However, there are only a few patterns with each magazine. Those were on pages marked with a picture of a tracing weel (pointed out in red here. don't worry that's photoshop). 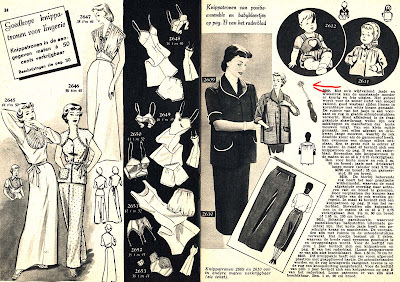 In this page, the maturnity and baby clothes on the right page are on the pattern sheet, the lingerie on the left page isn't. 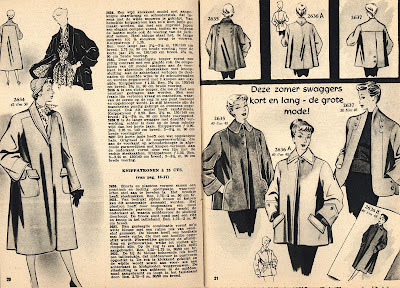 So, the nice swagger coats and those stylish dresses didn't come with patterns (and indeed I adore the pockets of dress 2 and the neckline of 3). 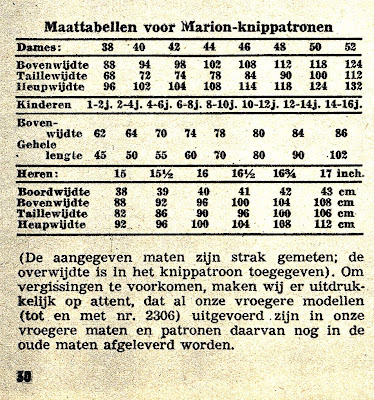 This is the Marion 1952 sizing table. Top bracket are ladies sizes, with measurements for bust, waist and hips. the middle bracket is for childrens sizes, which are determined by chest size and 'overall length' (of what? the child? Probably not because I'm pretty sure no-one is only 1.02 meters tall at 14... It might be leg length or that of some unknown sort of standard garment). The third bracket is for menswear which was sized not only by chest, waist and hip measurement but also by collar size. I know that's a standard for men's shirts so I guess it makes sense. I may study this a bit more and come back to it in a later post. 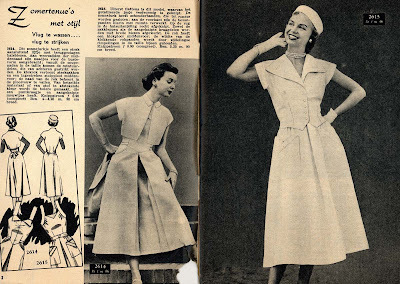 Last year, my aunt gave me a pile of vintage sewing magazines. They were 'Marion' magazines and mostly from the 1970's. I posted scans from them a few times. 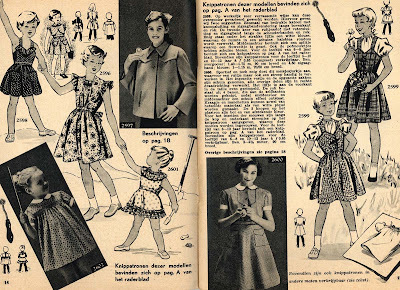 Recently, I decided to take a look at a local auction site in search of vintage patterns (I finally realised I should look in the 'collecting' instead of the 'hobby' category...) and I found some more... In fact, I bought the issues from June 1952 to July 1953 from one seller and a random selection of numbers (mostly one or two a year, with the early '60s missing) from 1954 to 1969 from another. And yes, I paid for it this time. Despite the cost involved (and let's face it: when do I ever spend on patterns?) I'm quite happy with my purchase and I've spend many a happy hour looking through those lovely little pages. Like the 70's Marions, these come with pattern sheets. One those, there is usually one pattern in each of their 'normal' sizes (for women and children and sometimes some menswear too). All patterns are one size only. 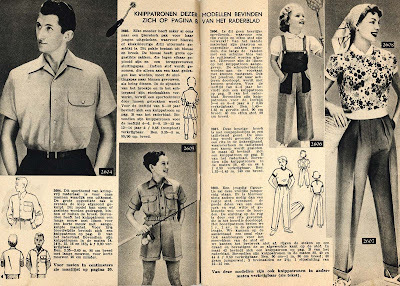 You could order those patterns in the other sizes and most designs in the magazine, usually including the most elaborate and glamorous, were only available by mail order. Strangely though, neither seller had any of these mail-order patterns for sale. Any way, I will so try and make some of this stuff. Well, enough talk for now, I'll just share some of the contents of 'Marion magazine nr. 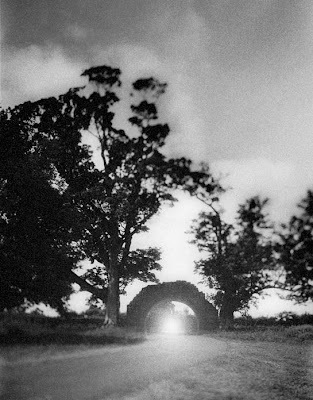 47 - June 1952' with you. Now, I'm back to show you the pattern pieces for that top. No real picture, because I sort of free-handed the whole thing, based on an earlier pattern. Some of you also asked me how having a center front or back seam could save fabric, so I've made this little schematic drawing of the pattern pieces as I would lay them out on the fabric. Please keep in mind that it's not to scale. As you can see, these cut-on sleeves take up a lot of width. So, if you only have to cut one piece on the fold, you can make do with little more fabric then what's needed for the top's length. The collar shape is also clearly visible here: once cut, it it folded on the dotted line, the front is stitched together between the point and the notch and closed separately from the notch to the dotted line. The whole thing is inserted into the body of the top after the front and shoulder seams have been sewn. As you can see, it's a very simple design and it's one of those which only work in knits. 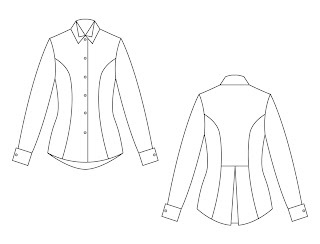 About the shirts with pattern magic collars: I plan to get started on those this weekend. I will make the curve collar first because someone mentioned wanting to make something like it herself (and I know Carolyn is a major Pattern Magic user, so that would be quite cool). 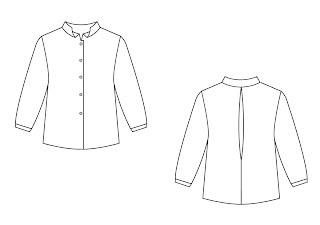 Obviously, I still plan make the double collar as well and document that process. Way back, in December 2011, I made a sweater in a sort of plum/aubergine coloured knit. A big, loose-fitting sweater decorated with a braid along the center front. That shape meant that it looked great with my shorts and maybe with skinny trousers. But not with much else. So, I bought another meter of the same fabric and made it into another sweater. This time in a shape which works with past-the-knee skirts. I've made this 'kimono/dolman sleeves and fitted at the waist' kind of shape a couple of times before and I still think it works well for me. It is the short of design on which you always want a center seam at either front or back, just to save a hell of a lot of fabric in cutting. This time it's a center front seam and I tried a new neckline feature in order to make it look natural. The neckline is fairly wide on the sides and has a V at the front. The collar fills up that V and has a center front seam as well, which is partially sewn up. Not easy to explain in words, but very easy to make. Just shout out in the comments if you want detail or pattern piece pictures. When posting about my sewing plans for 2012, I mentioned wanting to make more garments with Pattern Magic details. Although I won't have much time for sewing this week, I want to make a careful little start on this. 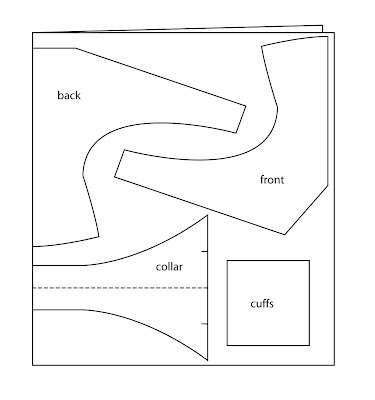 What I want to start with, are shirts with the nice, unusual collar designs from Pattern Magic 1. I've seen the double collar on a blog once, and the curve collar never. This may be because, like Carolyn (link goes to her blog, I can't find the specific post) mentioned, these projects describe the collars only, not full garments. It's not hard to incorporate them in any old shirt pattern though. Or indeed, to draft one using a sloper. Which is what I'll be doing. These are the designs I have in mind. For both collars, I tried to come up with blouses which, in my opinion, suit their shape and style. There's something soft and rather Japanese about the curve collar. Which is why I think it will go well with a fairly loose fitting body with three quarter length sleeves (either straight or with some fullness lightly gathered at the bottom). I added a back pleat simply because I like to do something at the back as well. This particular kind of back pleat (stitched up at the bottom) is a common feature in 1930's clothes and will look well with the shirt tucked in. Obviously, the bottom of the pleat could be left open for a more flared shape. The double collar vaguely reminds me of those rigid Edwardian stock collars. Because of that, I saw it immediately with a fitted and detailed kind of shirt. So: armhole princess seams and a pleated lower back panel. Long sleeves with french cuffs. If you want to go for a real Victorian inspired look, you could make leg-o-mutton sleeves, but I won't this time. I am going to make both of these shirts. If anyone would like to make something similar, I'm happy to share the drafting process here on my blog. I'm not going to make this a sew-along, so you don't have to want to make this right now. Also, I'm not going to show how to do the collars exactly because I think that might a violation of the Pattern Magic copyright. So, it's basically for anyone who has the Pattern Magic book but doesn't get around to making a 'detail' project like this. If you're interested, just say so in the comments and tell me which shirt you'd like to see/try first. It's been one of those weeks when every day, either I or my boyfriend get home late, so we have dinner late and so, even on those evenings without other obligations, I get no sewing done. I've actually been watching more TV than usual. 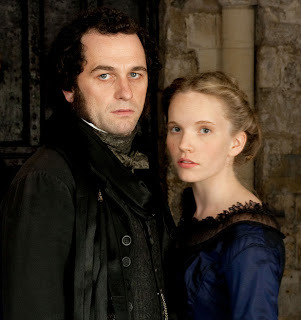 The good thing about this is that, on BBC 2, I saw the new two-part period drama the Mystery of Edwin Drood. It's a particularly dark tale based on an unfinished story by Charles Dickens. And in good BBC tradition, the acting is good and so is the look. If you've been watching Tudors before, you'll recognise the actress playing Rosa here (she also played Jane Seymour). Obviously, apart from enjoying the story, I was also studying the clothes and I just love the neckline decoration of Rosa's mourning gown (this was the best picture I could find of it, you can just see the effect on her shoulder). 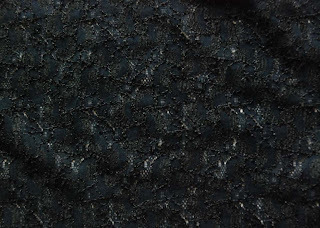 Black lace slightly gathered from the solid fabric's neckline to its own... Can't you just imagine that in a sort of '50s style dress? Like a more modest and/or more frilly version of an illusion neckline? I'm going to show you a pair of trousers which has actually been in a picture on this blog before. I made these trousers back in November and wore them in the pictures of 'wearing a square'. At that time, I didn't photograph them on their own and I cut those pictures at hip length so they were not on display at all. I may have forgotten about them because they were very easy to make or because, at that point in time, I wasn't quite sure about how to make them work in my wardrobe. I shouldn't have because they're great. They're comfortable and, by now, I love the look. These are rather skinny trousers, not my usual look. As you may have noticed, I haven't done one of those posts to round up my sewing over the past year. I actually enjoyed reading those of others and they made me think back about what I made last year but I think I have missed the moment. Just thinking back was enough to remind me that this wasn't quite the not-very-interesting year I was starting to think it had been. I made a jacket using traditional tailoring technique. And a hell of a lot of work on the jacket block. I also made jackets for other people (my friend J told me at the New Year party how much she still loves hers. Unfortunately, E's wasn't as succesful). I also made a fun little cropped jacket for which I finally used the leather from E's old coat. And then, I continued to experiment with more loose-fitting shapes and I really commited to building a more colourful wardrobe (the links here just show examples of what I mean by that). And I started playing around with Pattern Magic and tried jumpsuits for the first and second time, and shorts. Right now, I have every intention of going back to regular blogging. I'm not going to try and revive the draft-along any time soon because I'm still quite busy, but I do have every intention of creating some small 'jump-in-if-you-like projects'. Obviously, I will continue to make all my own clothes. 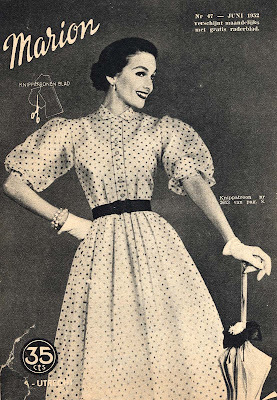 I think there will be more Pattern Magic stuff in the near future (also good for the aforementioned projects) and I may actually try and sew up things from the few vintage patterns I own. Along that last line, I'm very exited to be a test seamstress for the Vintage Pattern Library's 1912 Project. Being a no-patterns kind of girl, I've looked at vpll before, after reading about it on other blogs, but I've never actually dealt with them before. However, I signed up and got an email saying I'm in. 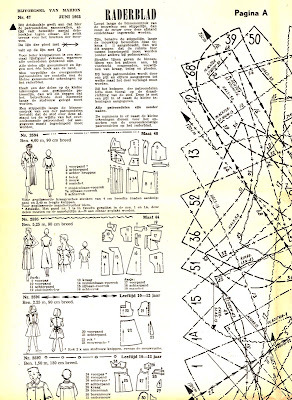 Basically, they are digitalizing the 1912 editions of sewing magazine 'La Mode Illustree' and all those patterns will need to be tested and annotated by and for today's sewing community. There should be one pattern to be tested each month, and I fully intend to stick with it, so you can definately expect to find that on this blog this year. I think this will be all for now. I'll be posting some of my last 2011 creations this week (because I only managed to get reasonably OK pictures of them last weekend) and I will announce any new plans when I get to them. 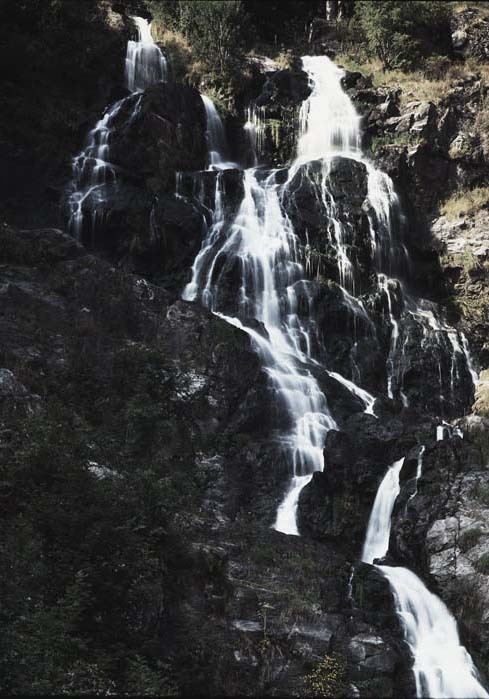 And the waterfall? It's just because no-picture post are boring. 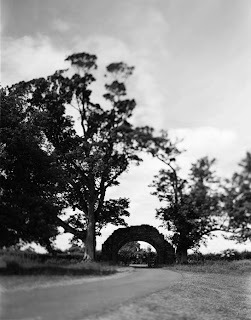 This is a photograph I took on my 2011 summer holiday, using my old technical camera. If you are hosting a New Year's Eve party for some friends, it's probably not a good idea to decide you want a new dress for it on short notice. Certainly not if you're going to make it from scratch and don't have time to start on that until the afternoon of 31 December. Which is just what I did. There were redeeming factors though: this is an extremely simple dress, drafted from my knit sloper and I had all the materials in my stash and by the time I could start on it, all the party preparations where done and E was going to cook dinner that evening (and he made a great chocolate cake, yum). The fabric for this dress is a textured stretch lace (which is unfortunately very hard to photograph) which had been in my stash for years. There was only 1 meter at 1,10 m wide, so it could only just become a dress. I had wanted three quarter length sleeves but, with the fabric available, it was either cap sleeves or an all-in-one facing. Under the lace, I used a cream coloured, silky knit lining. I treated it as underlining both to speed up the construction and to avoid very visible black lines at the sides an darts for the seams in the lace and to keep issues with the different behavioural characteristics of these two fabrics under control. The shape is extremely simple. It has a bit of a boat neck, is fairly fitted down to the bustline and from there to the hem, the sides and straight and only flare out a little bit to allow a bit of ease at the hips. The end result, as to be expected, is a bit '60's.